Dentistry, and oral hygiene in particular, plays a very important part in general health. When teeth are not well cared for, bacteria from the mouth can propagate through the body using the circulatory system, a process known as bacterial shower, and this can eventually cause all sorts of problems. Additionally, as we all know, dental issues can often be the cause of intense pain and suffering. Why is dentistry so important ? Humans are advised to brush their teeth every day, ideally multiple times a day, and to have them cleaned (scaled and polished) at a dentist’s office once or twice a year to prevent such problems as cavities and gingivitis. This recommendation should also apply to pets but unfortunately, for various reasons, it seldom does. One of the reasons often mentioned is the price charged for this procedure. However, tooth scaling and polishing are not major surgery or complex, invasive, time consuming procedures. On the contrary, they are, in fact, relatively simple prophylactic measures when there are no complications. 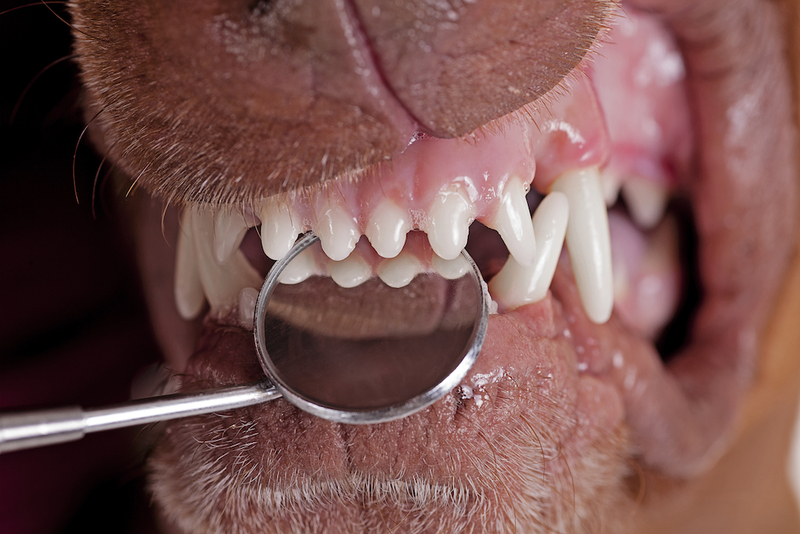 Unfortunately, people often hesitate to incur the cost and with time their pet gradually develops more severe problems (abscesses, receding gums, tooth decay, etc. ), which are more painful and more costly to remedy. This becomes a vicious cycle in which everybody loses, especially if costs escalate to the point where euthanasia becomes a likely outcome. This is why we strive at Clinique vétérinaire Villeray-Papineau to keep the prices of tooth scalings and other dentistry procedures as low as possible. If there are no complications, the amount we charge is similar to what a dentist would charge, plus the anesthesia. This allows the owner to have dentistry performed as a preventative measure, performed more often, while still saving money. As a consequence, their pet then has a better quality of life, a better breath, and it can keep its teeth longer. You can find additional information about dental health here.